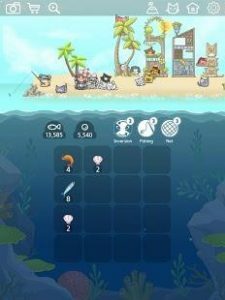 2048 Kitty Cat Island : Connect the same image to catch as many fish as possible. Stir in the sea horizontally / vertically to assemble the same kind of fish. Catch fish are used for island expansion, building construction, cat adoption. If you catch the largest creature, you can move to the next island. Adopt 50 unique cat species in each island! Listen to the cats happily in Paradise you made with 2048 puzzles. Use fish or pearls to widen the island and build the building. There are 7 buildings in each island. I love this game. It is fun, challenging, addicting & relaxing. The cats & Tui are adorable. I love when the cats get hats & bows from the store and get super huge from eating at the restaurants. I’m really excited for the update!….Thanks for ice island! When will the next island be ready? This is a cute and a good game to pass time when I’m bored. Has cute characters and nice graphics. I really enjoyed this game so far.